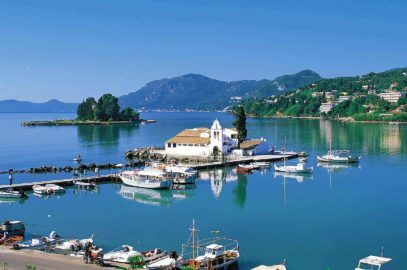 On an island like Corfu, with huge rainfall and rich and inexhaustible water table one would expect that the water supply of the city of Corfu with plenty of good quality water would be an easy task, but this is not the case. 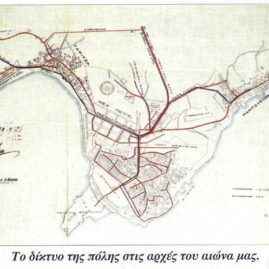 Indeed this was the case in ancient times when the ancient city was situated on the peninsula of Kanoni and took water from the local sources of Kardaki and today`s named Vrisoula . Water resources then was enough even for the ever growing to the south city , also wells were opened everywhere and gave good quality water . 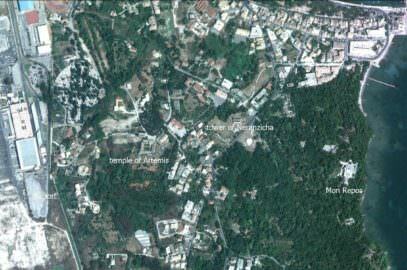 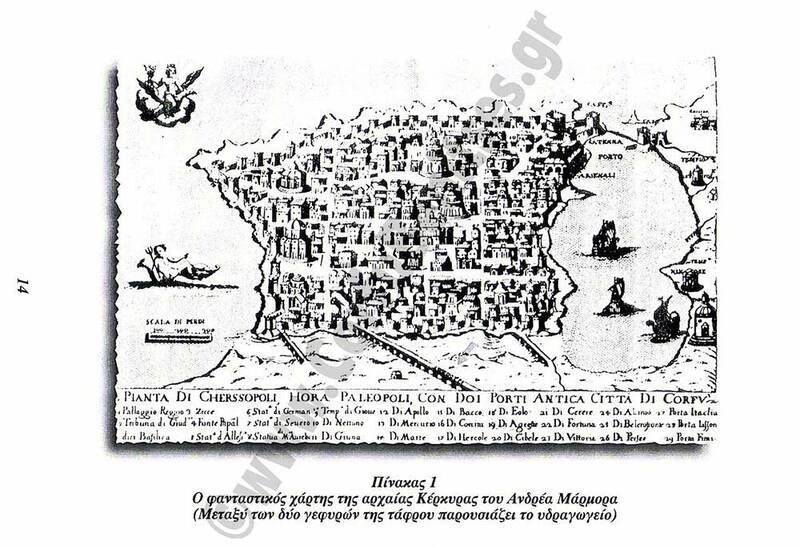 That also was one of the foremost reasons for the choice of city`s position by the first Greek settlers from Corinth. 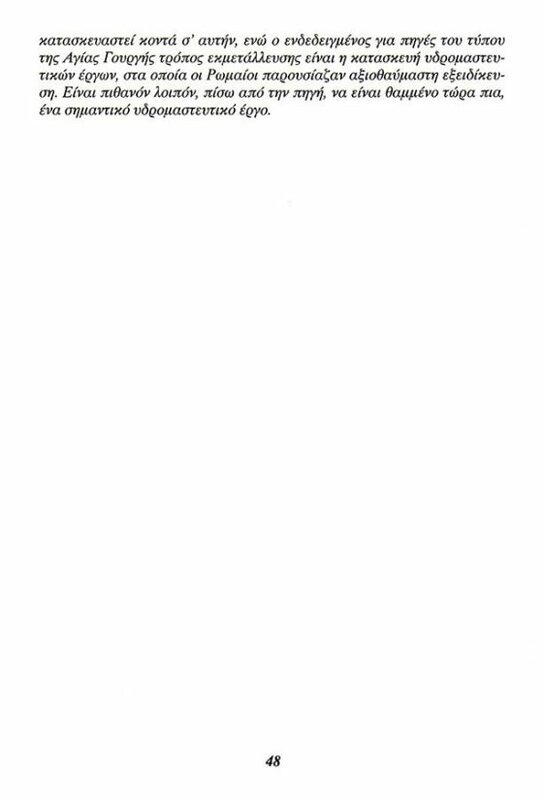 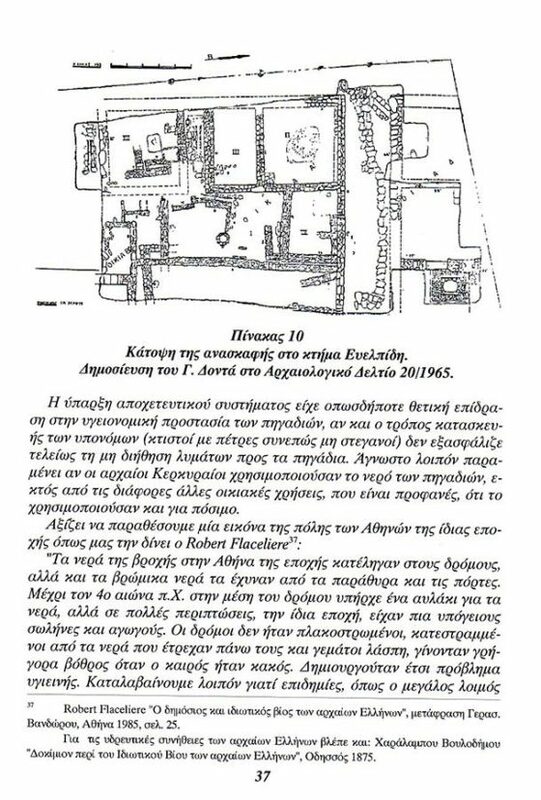 After the 6th century AD , however, things changed . 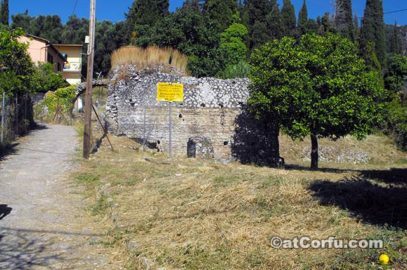 The ancient city already devastated by invaders abandoned by it`s residents who choose the new position with the sole criterion of safety . 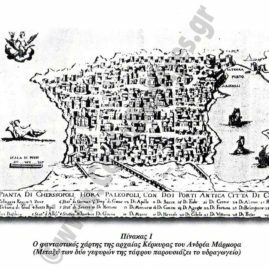 So as core of the new city was selected the steep ridge land of old fortress and the land in front of it was the position for the extended new city. 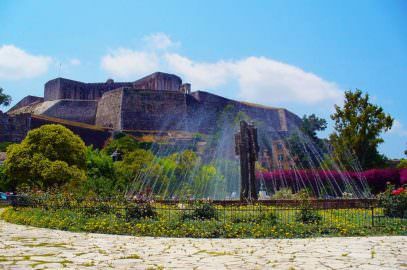 Since then the problems started because the subsoil of the old fortress and the city could not afford but only poor quality brackish water that was not enough for a city that wants to grow and develop . 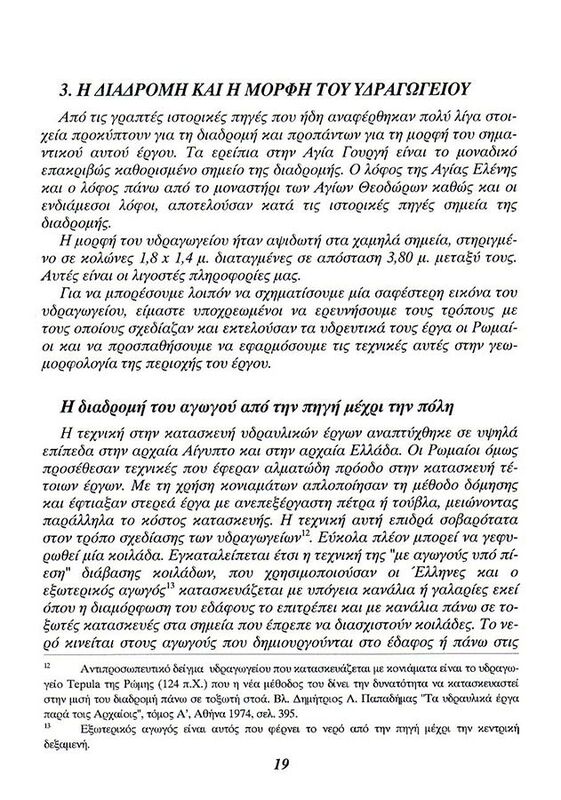 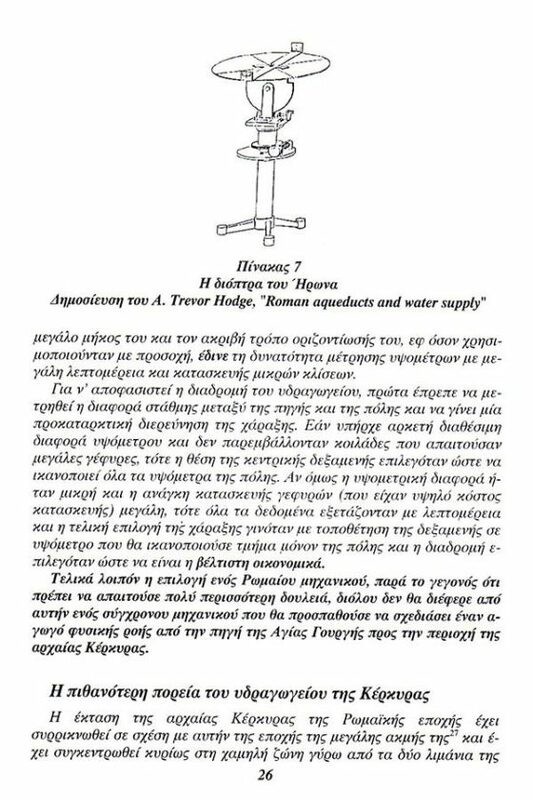 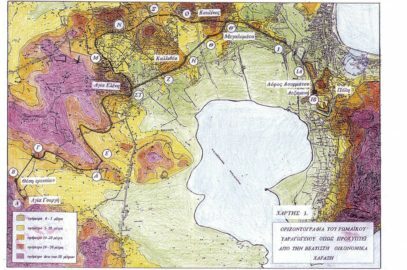 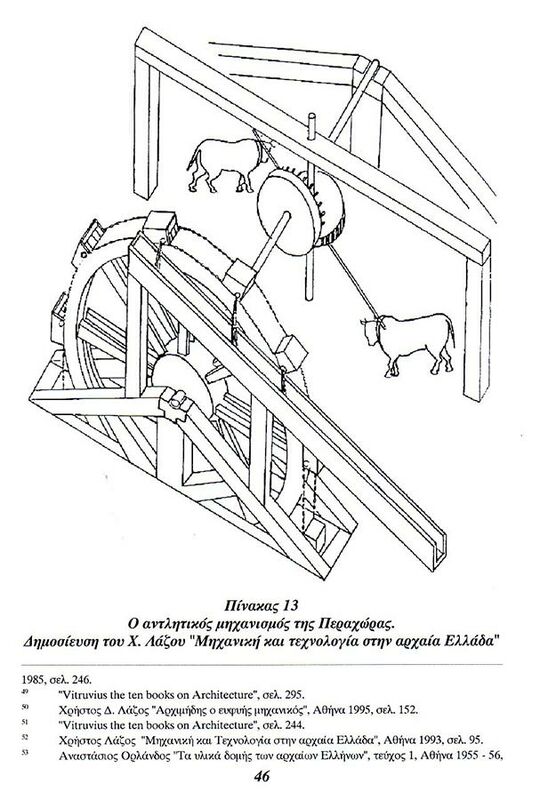 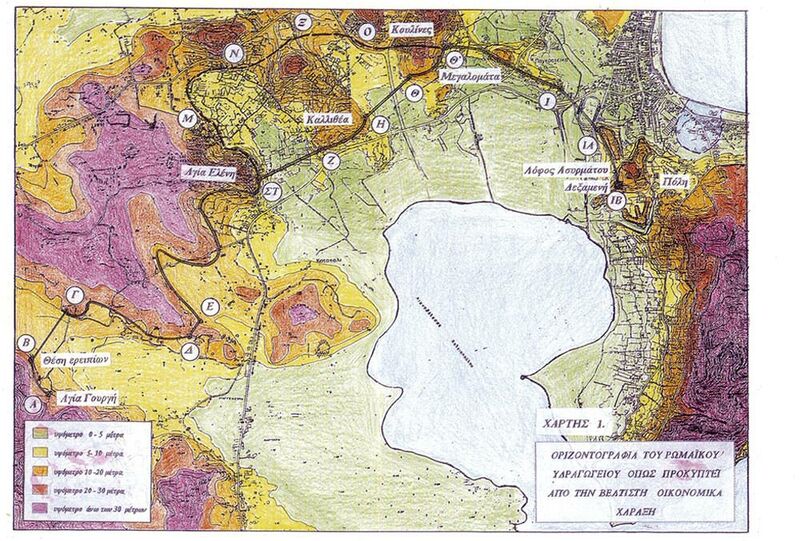 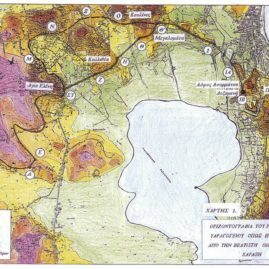 So right from the ` principle became apparent that infrastructure was needed capable to carry water to the city from nearby sources especially from the old source of Kardaki, which at the beginning was done by animals and humans due to its proximity . 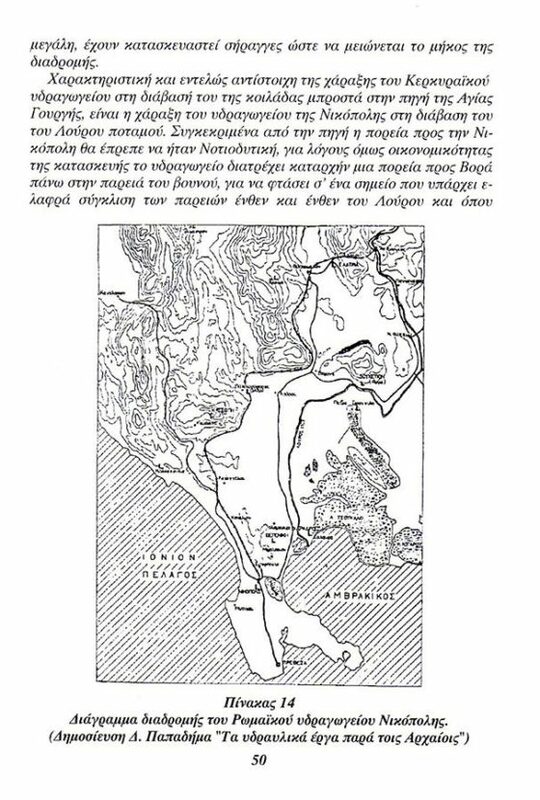 The Romans first between the 1st and 2nd century AD during the Pax Romana era, created the first aqueduct network in Corfu and transport water from the source of St. Gourgis, source Lartourou in Vryoni area and the source of Chrisiida. 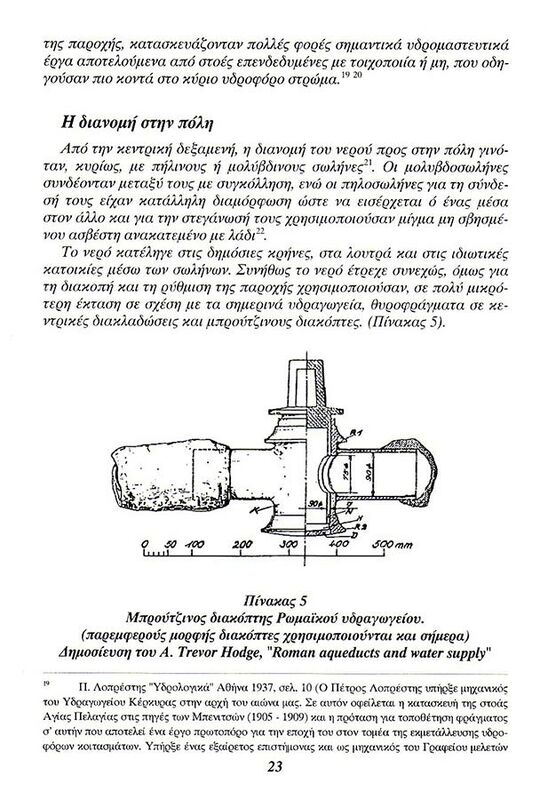 Because of the low altitude of the sources the Romans built pumping mechanism that raises the water tank at altitude so that then leads to the system of the city with natural flow. 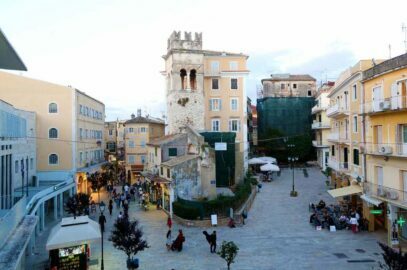 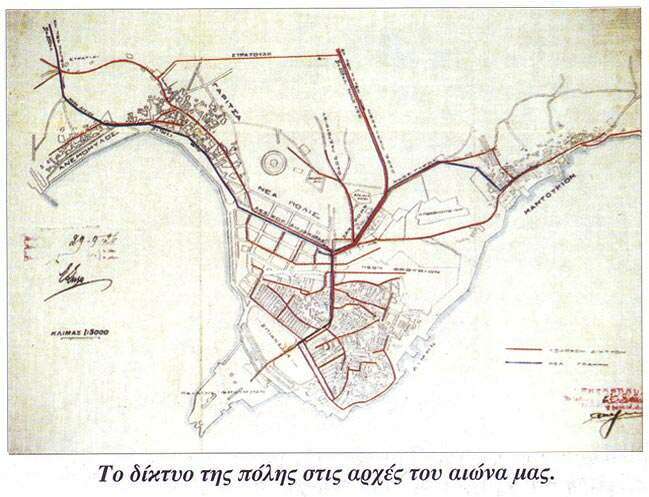 During that period the water supply of Corfu town was based primarily on the Roman aqueduct with small improvements and repairs , data for this period are not well known as at that time very little attention was given to water and sanitation systems . 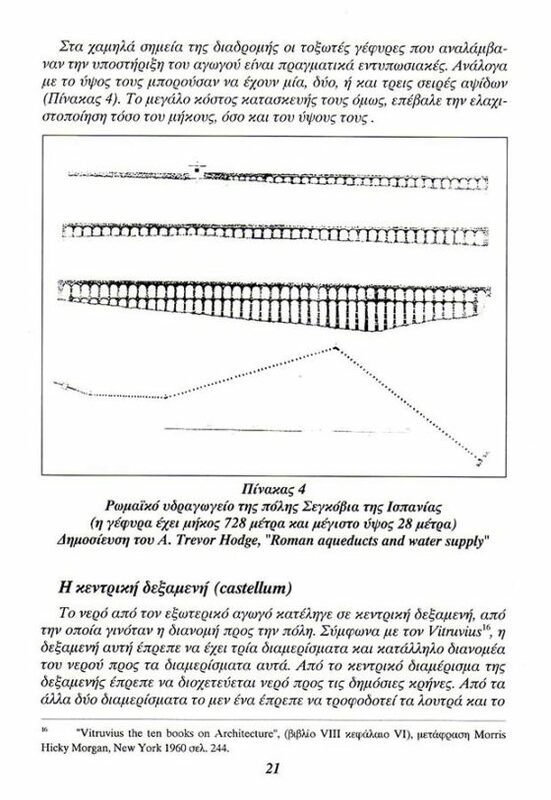 And the Venetians later continue to use the Roman aqueduct , they improved the efficiency of it by constructing large tanks in the city which they filled with water from all around the city available sources and especially from the source of Kardaki . 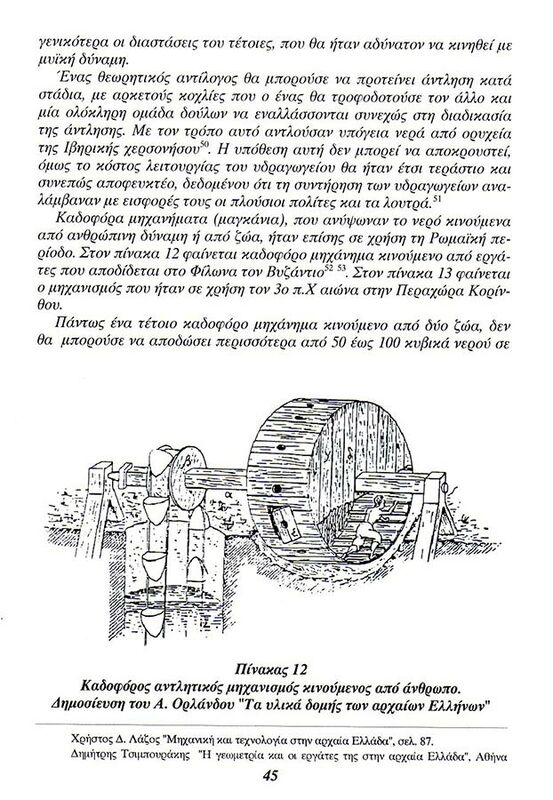 In times of drought , however, the problem of water scarcity , especially for the poor people, taking tragic proportions especially during the summer months when either the mills were not in operation due to lack of water and so there was no flour. 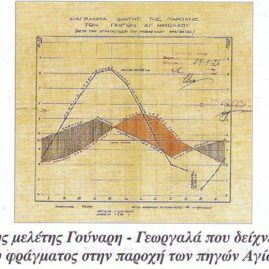 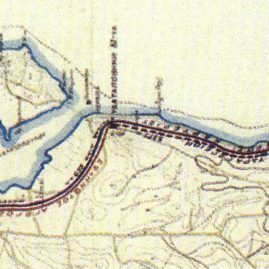 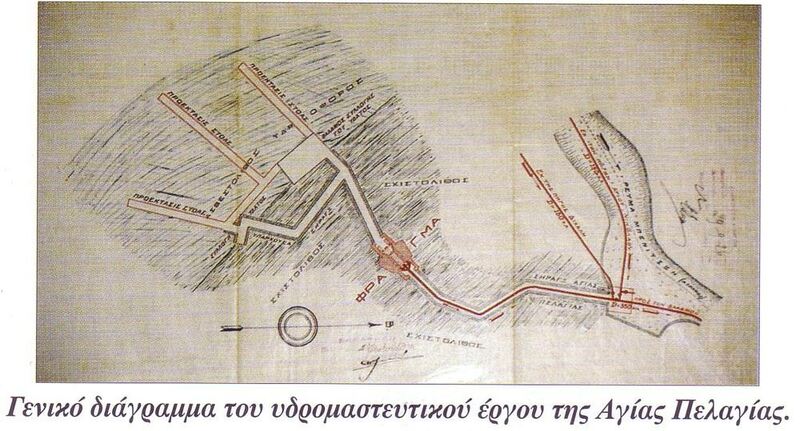 The period of British occupation finds Corfu with known problems, then the British High Commissioner Sir Frederick Adam decided to give a definitive solution to the problem by transferring to the city plenty of fresh drinking water from the source of Carteri and St. Nicholas in the area of Benitses . 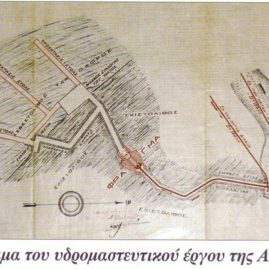 On October 18, 1830 in the Senate he proposed the construction of an aqueduct in Benitses within 6.5 miles and in an altitude of 55 meters , the project budget was then 19,386 pounds. 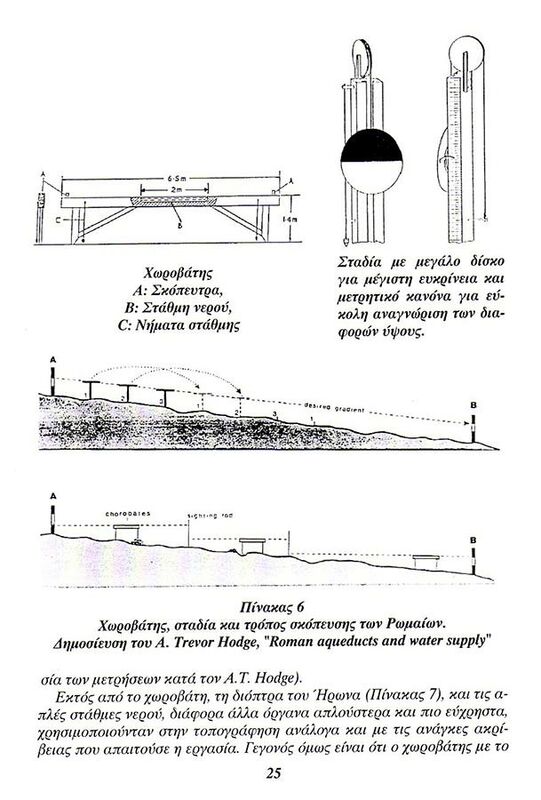 The Senate did unanimously accepted the proposal of Sir Adam and the water supply of the city from the new aqueduct began with a majestic ceremony in the Esplanade square just 10 months later on August 7, 1831 . 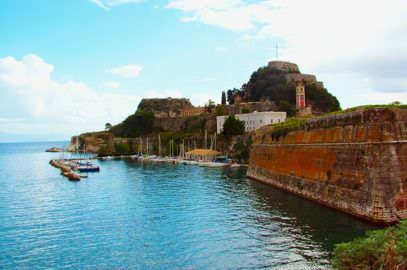 The fact that pure and clean water was imported to town for first time was an event of huge importance for the citizens of Corfu. 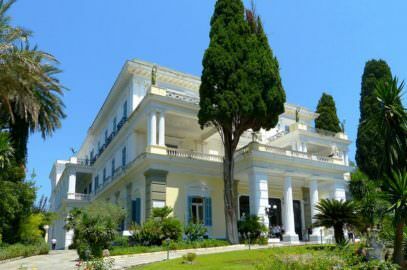 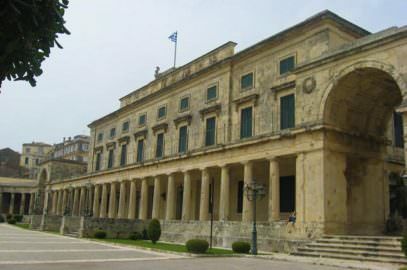 Sir Frederick Adam made ​​several other projects and also his wife was a local Corfiot, for this certainly was the most likable commissioner passed from Corfu. Unfortunately, neither this project was to give a permanent solution to water supply problems . 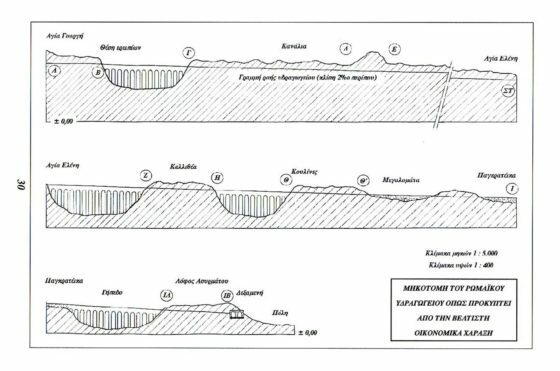 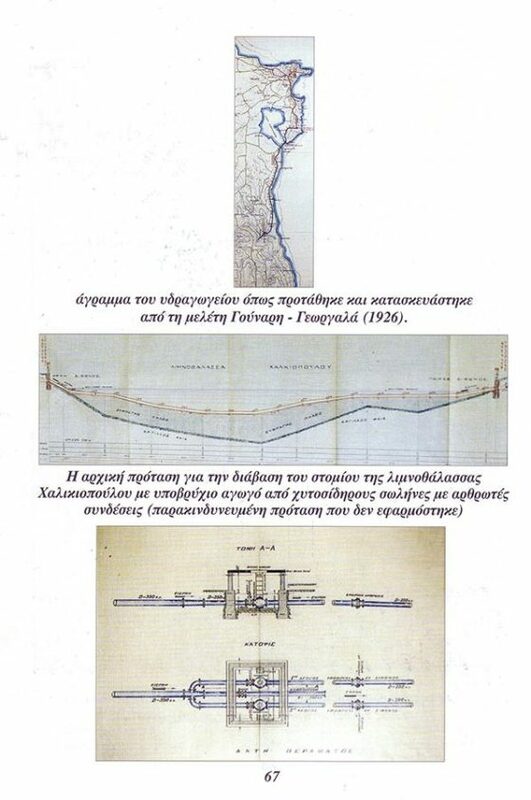 Due to various defects in some parts , damages to pipelines, low altitude of the intermediate reservoir of Perama, wastage and the always growing demand the problem returned . 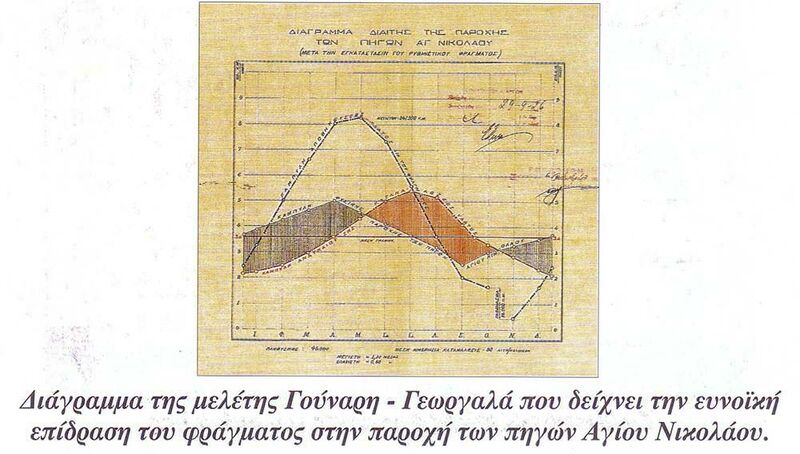 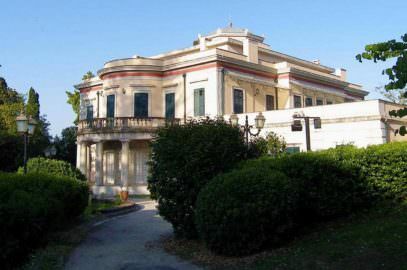 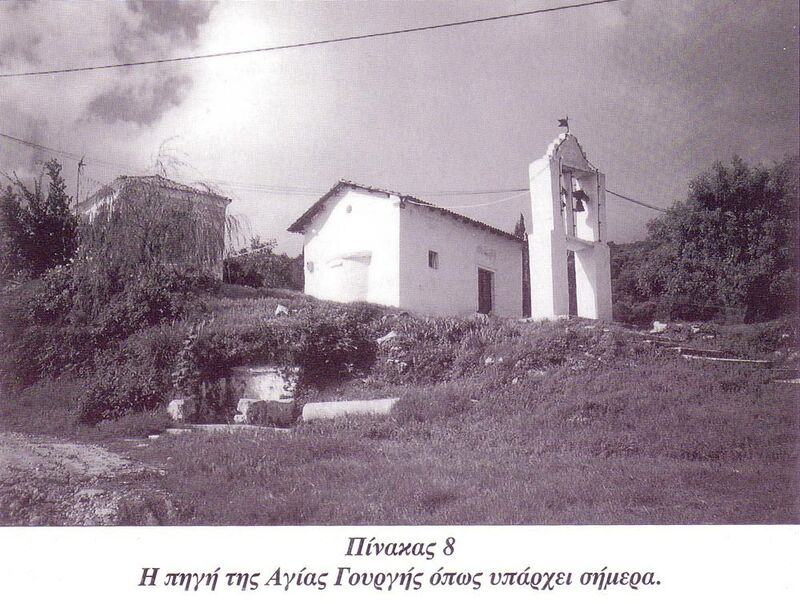 Also mills operating in Benitses contaminated the water with residues of flour so water arrived in Corfu blured, the expropriation of the mill was impossible because of the high cost but most because they were necessary to grind the wheat. 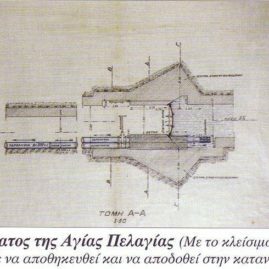 In 1875 the mills were purchased and this solved the problem of haze , but also additional important projects were needed to improve the flow and the amount of water that reaches the city. 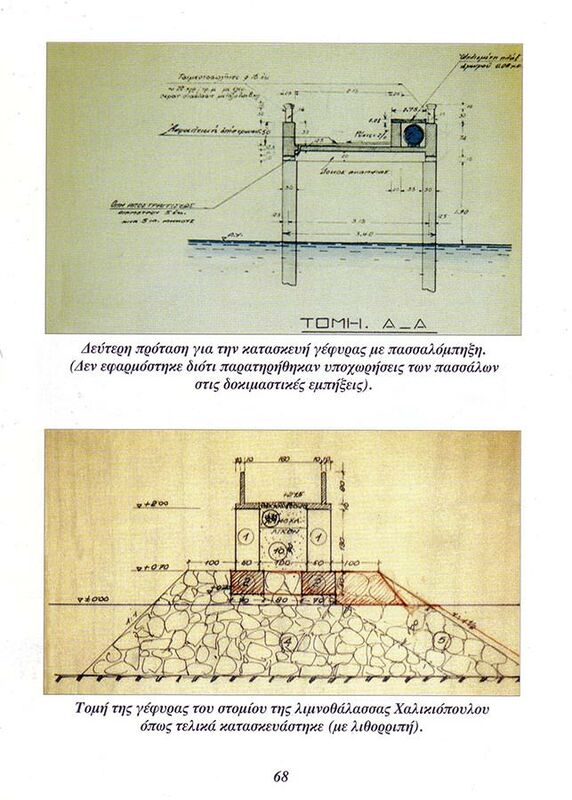 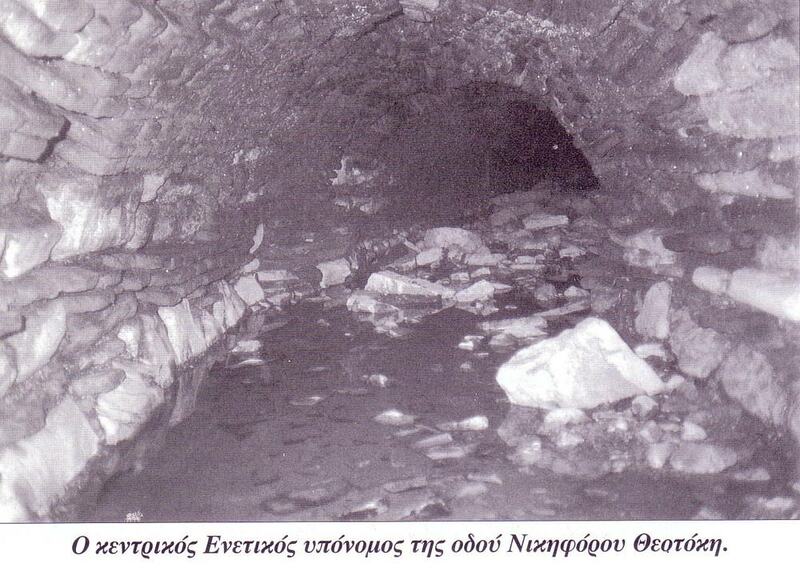 In 1908 after the proposal of engineer P. Loprestis ​​a new water barrier, the so called Gallery of Agia Pelagia was build in Benitses aqueduct where sources were, also at this time many old pipes were replaced in the city center . 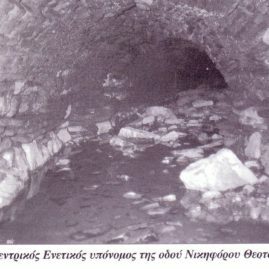 In 1926 after studying of engineers Gounaris and Georgalas, a pipeline constructed at the mouth of Halikiopoulos lagoon, under the bridge that connects Perama with Corfu in front of the airport, which filled a huge reservoir on the top of Analipsis in Kanoni, so the aqueduct took the form which has about until today. In recent years the demand for water increased dramatically , sources of Benitses due to faults in the network , waste and large leaks of years now can not fully supply the amount needed . 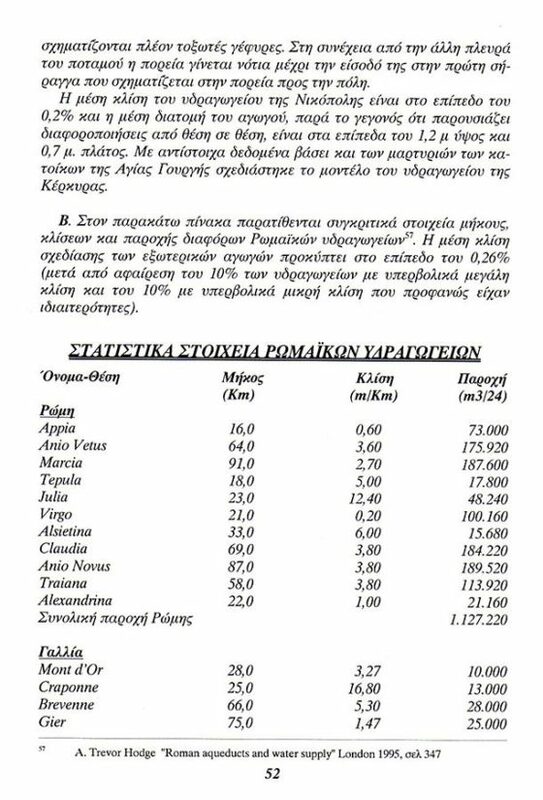 Many ways and projects have been proposed and have been done, most without success , as the failed experiment of water softening in Perama which closed due to high cost . 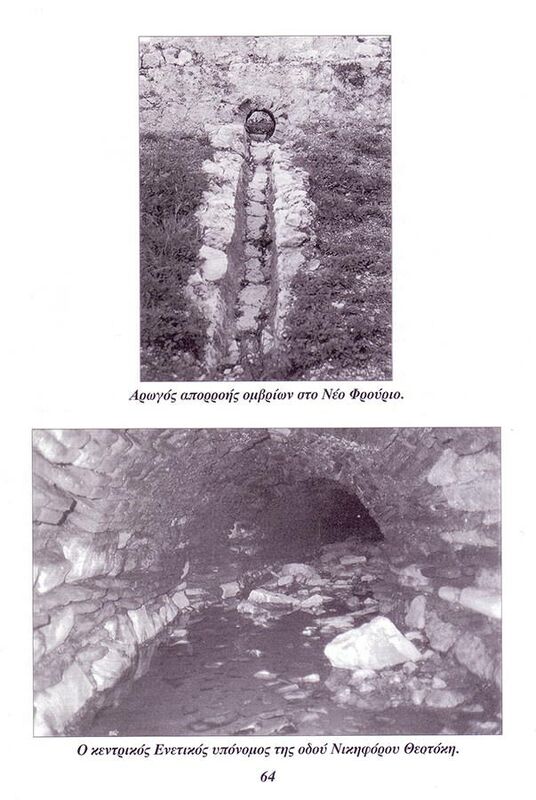 Attempts were made and several new sources added in the system causing the problem of quantity to disappear but the problem of hardness due to the poor quality of water sources at Chrisida , Gardiki and Tzavrou area remains. 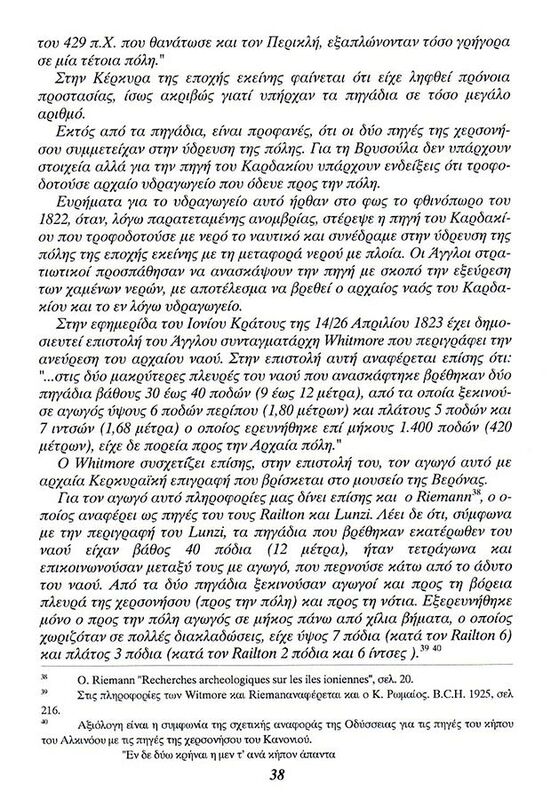 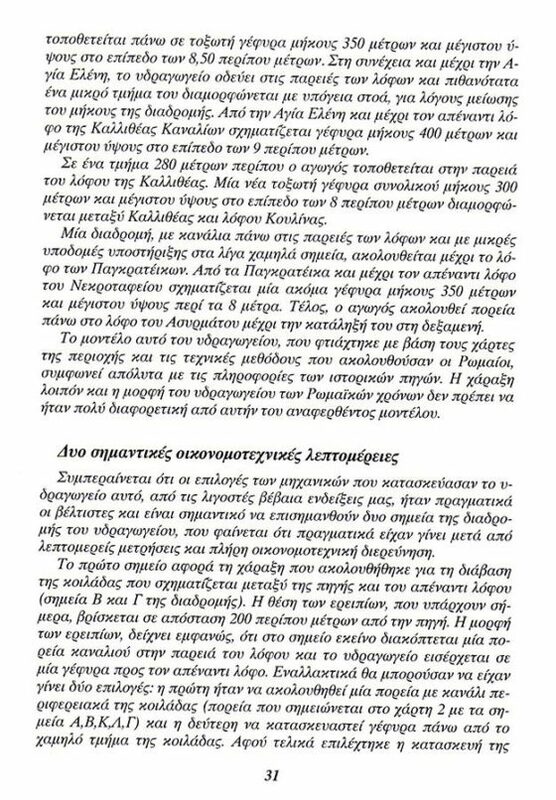 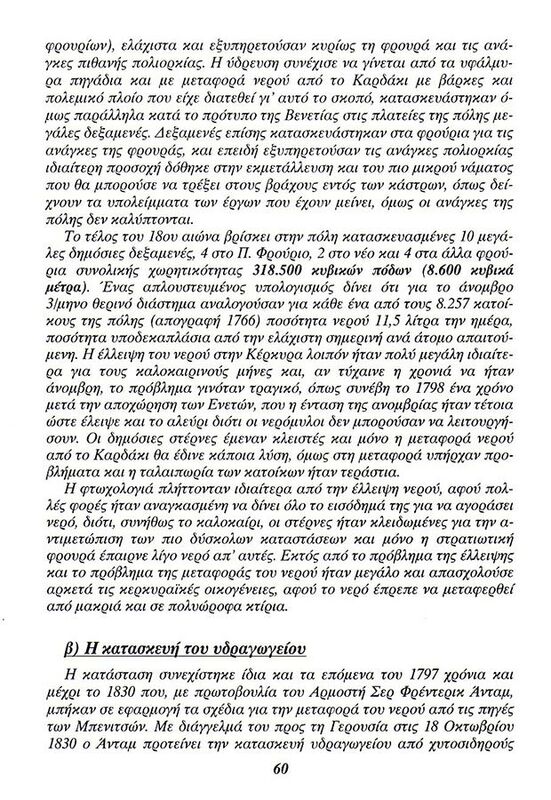 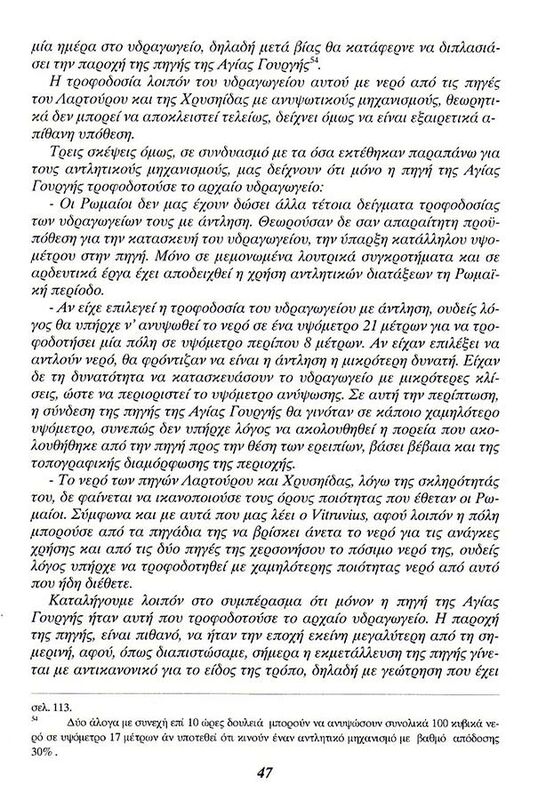 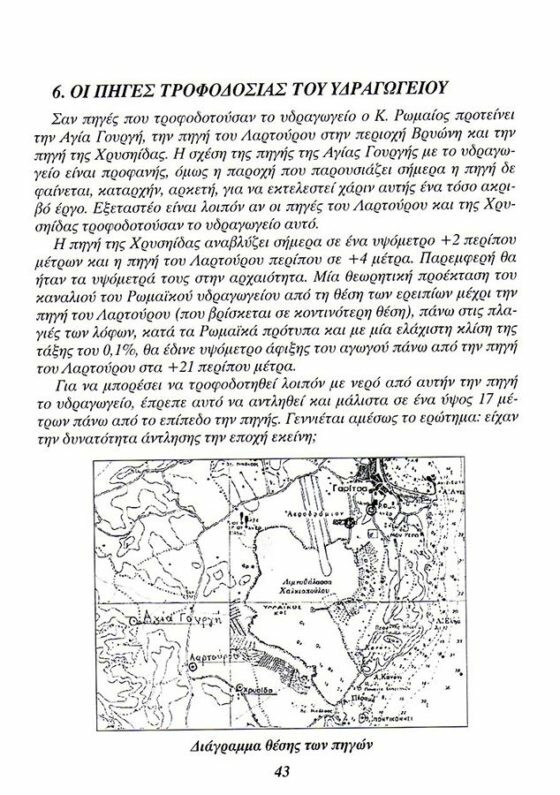 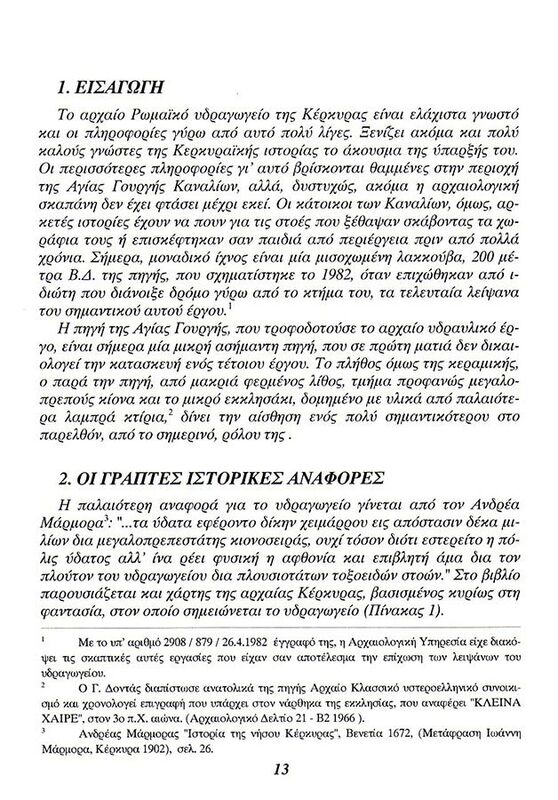 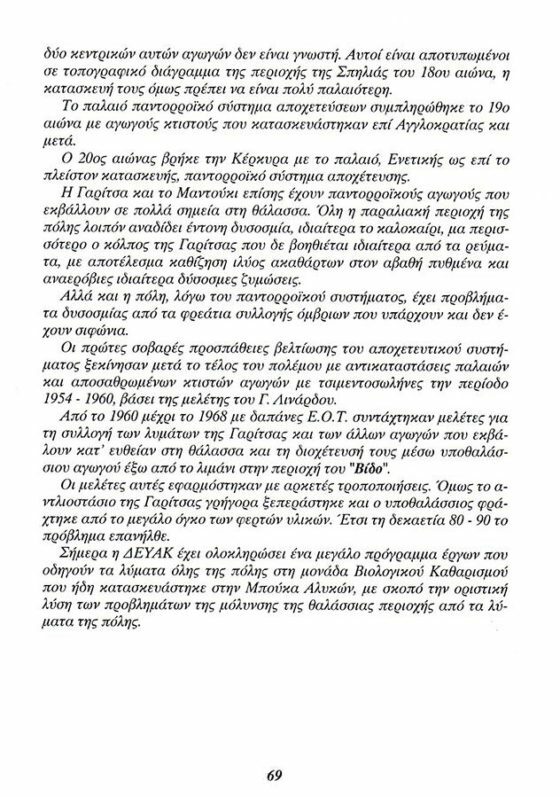 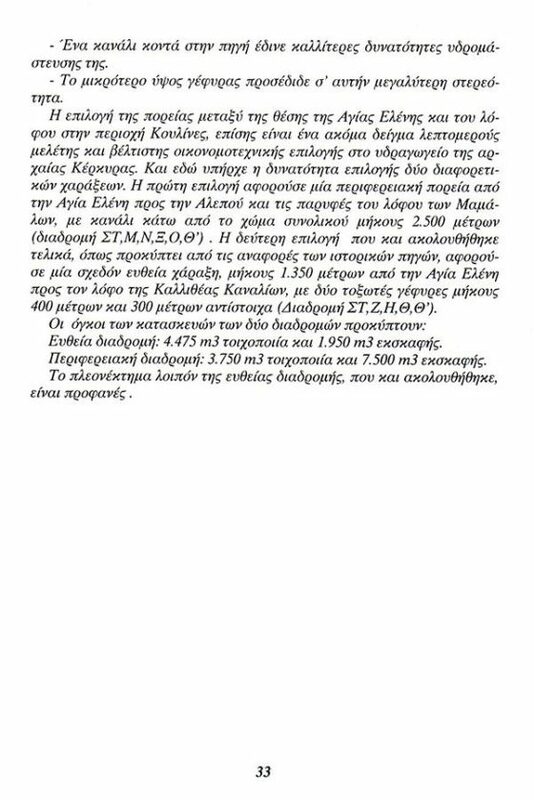 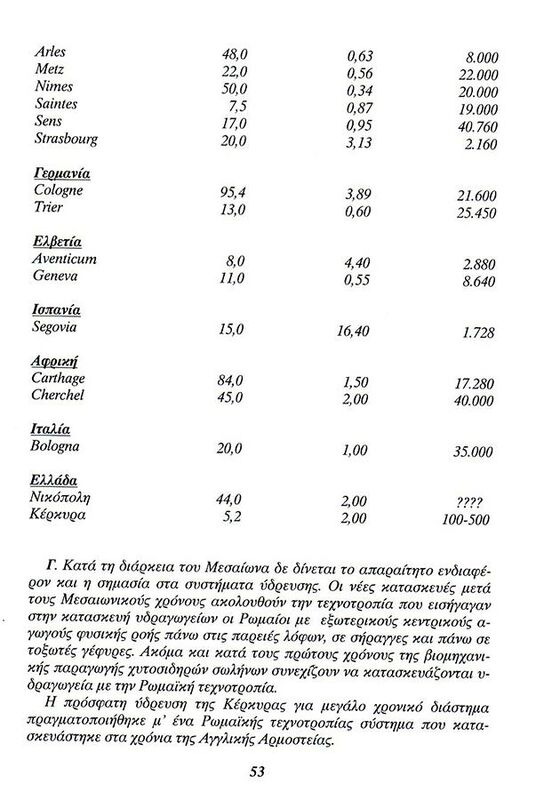 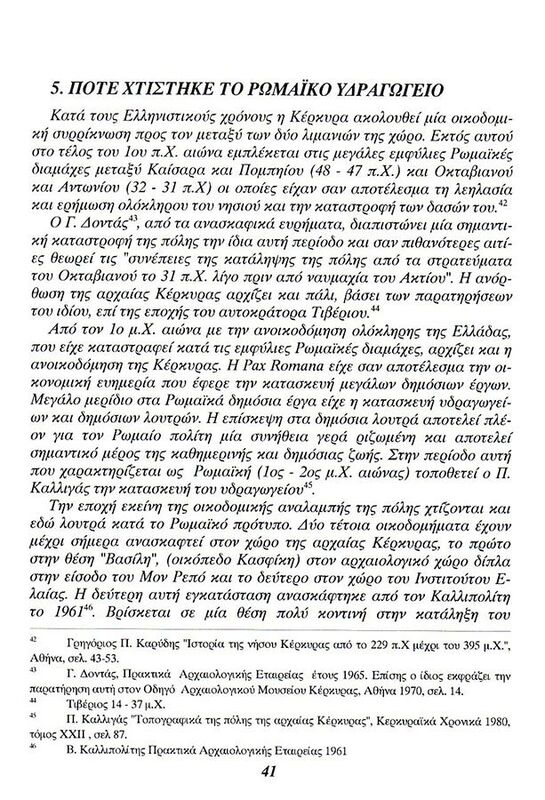 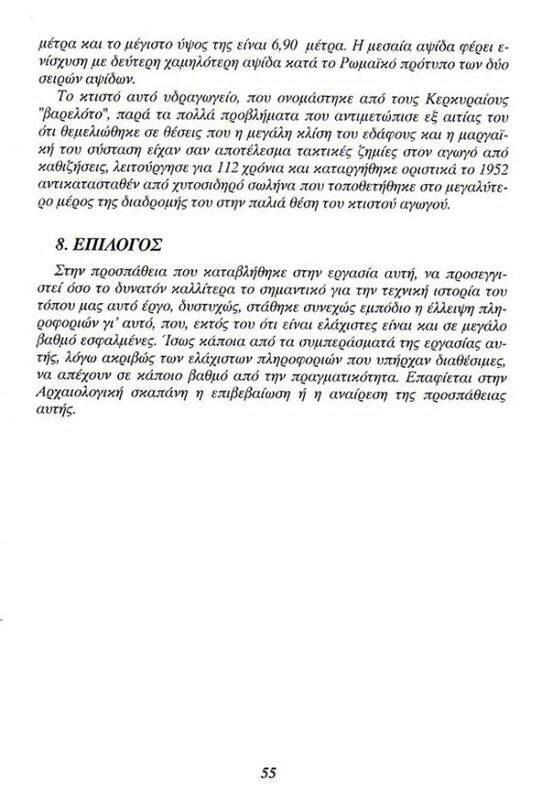 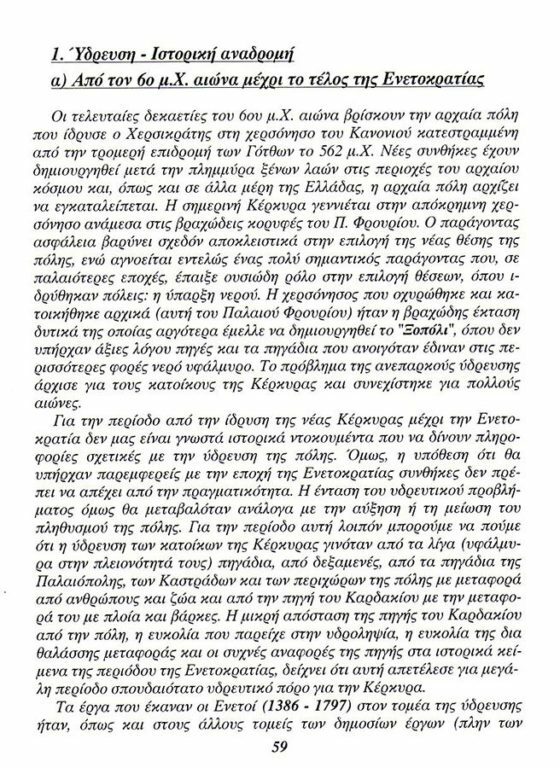 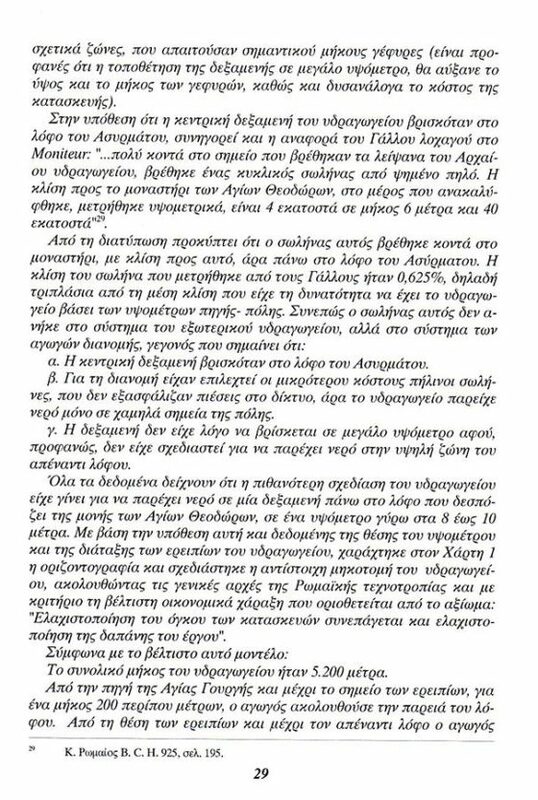 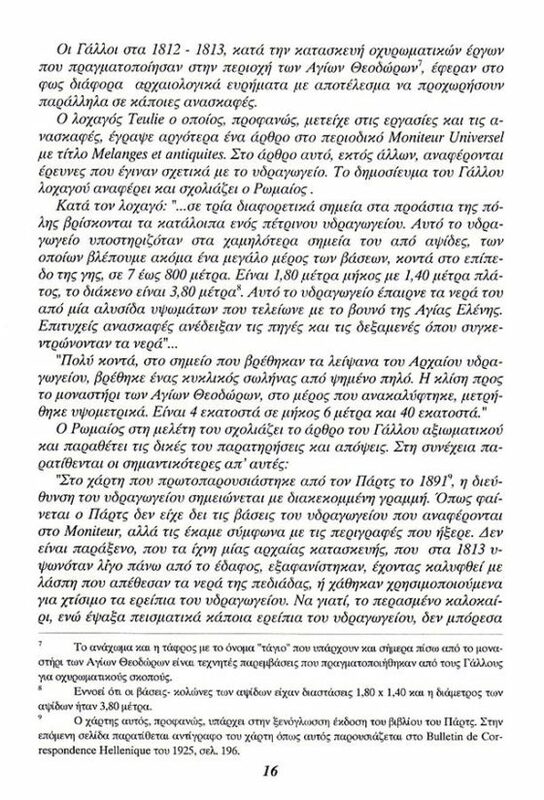 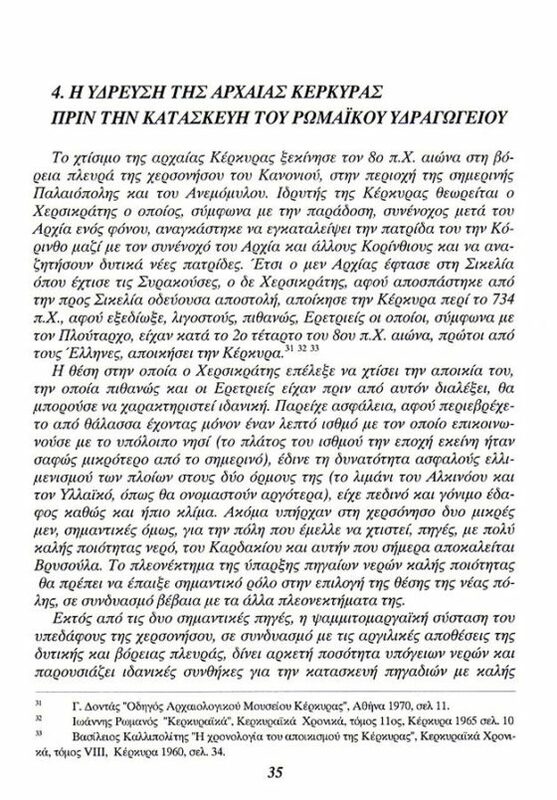 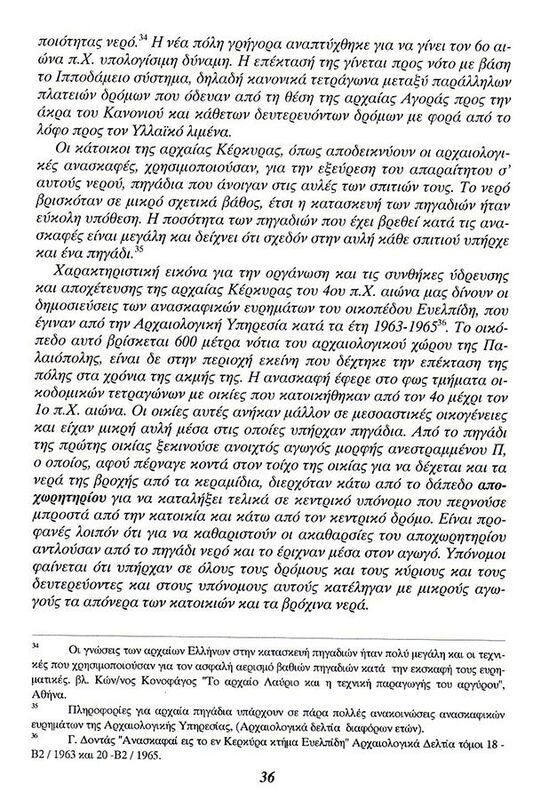 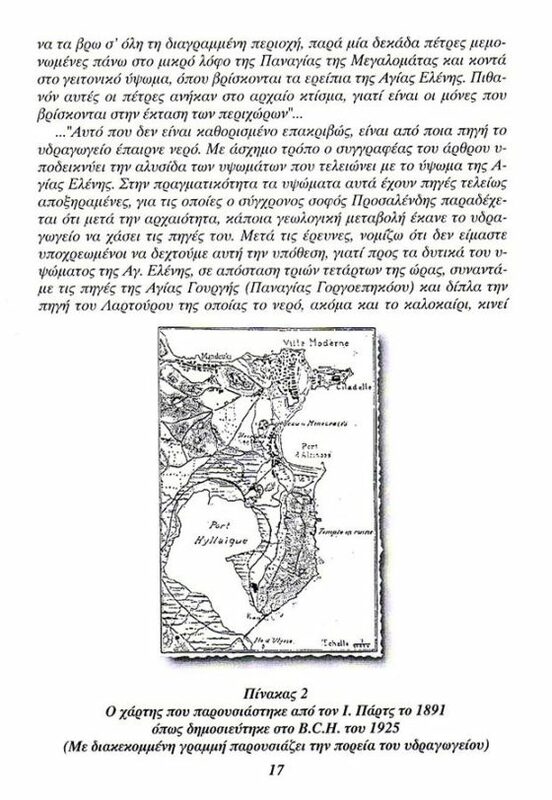 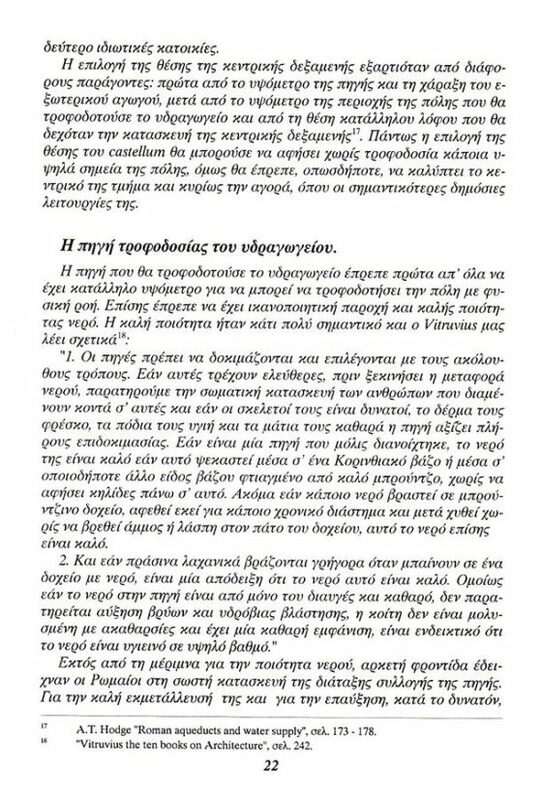 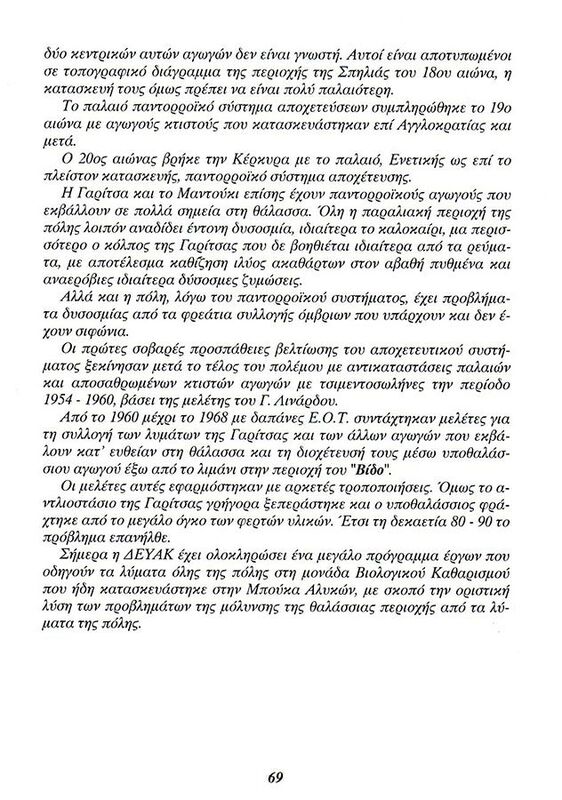 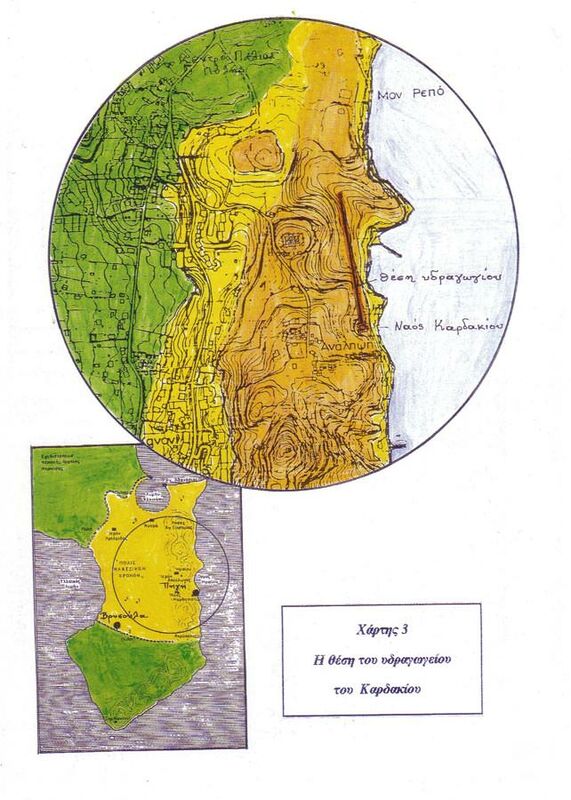 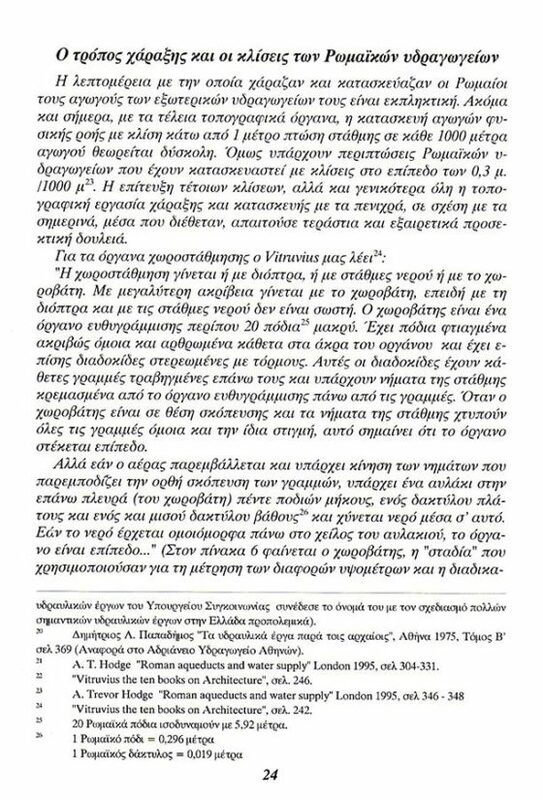 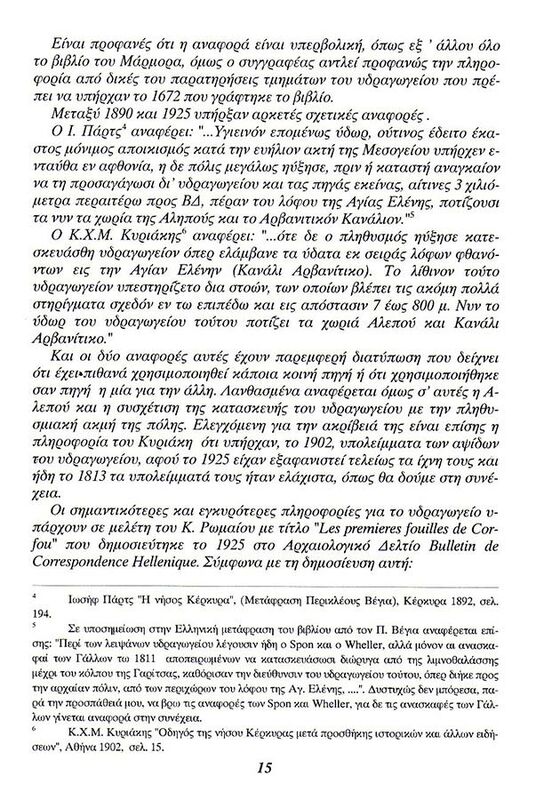 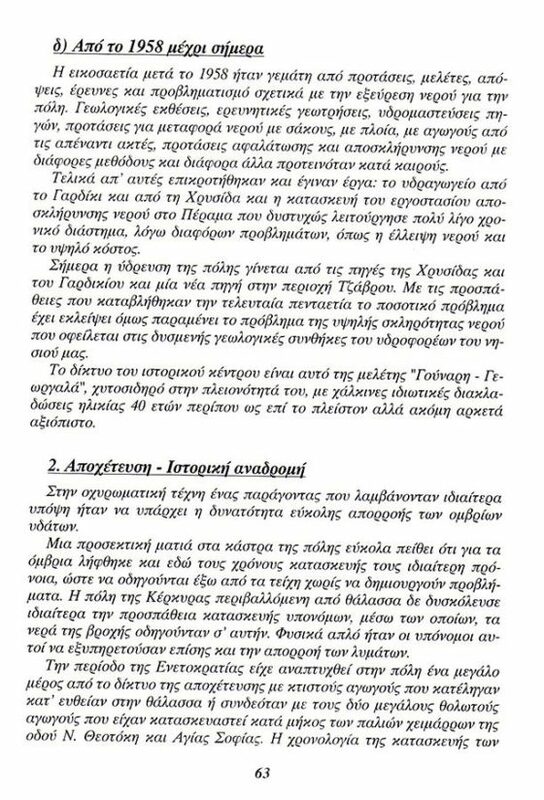 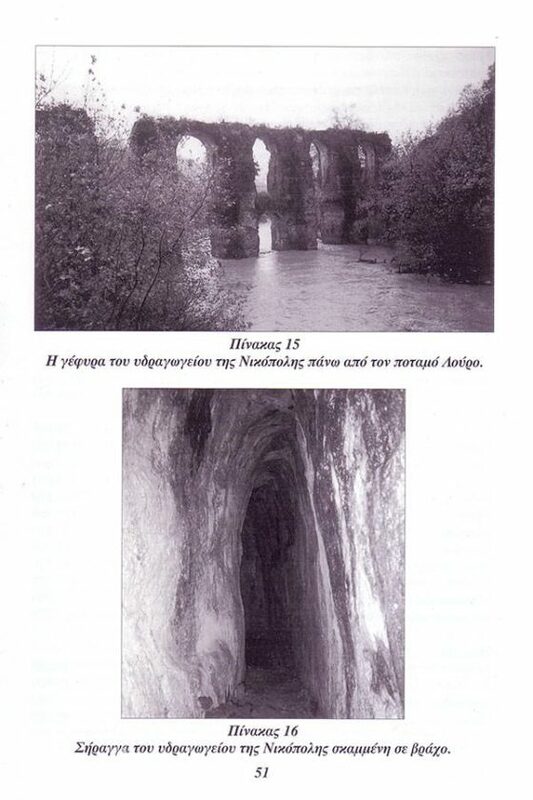 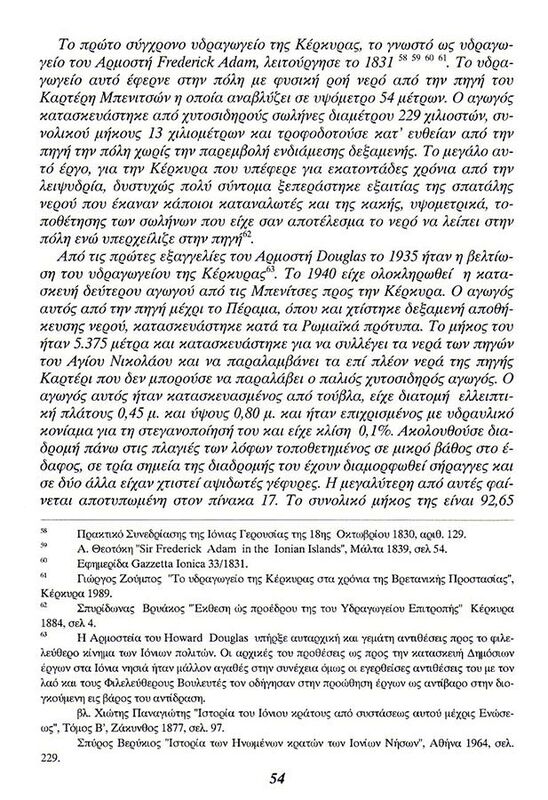 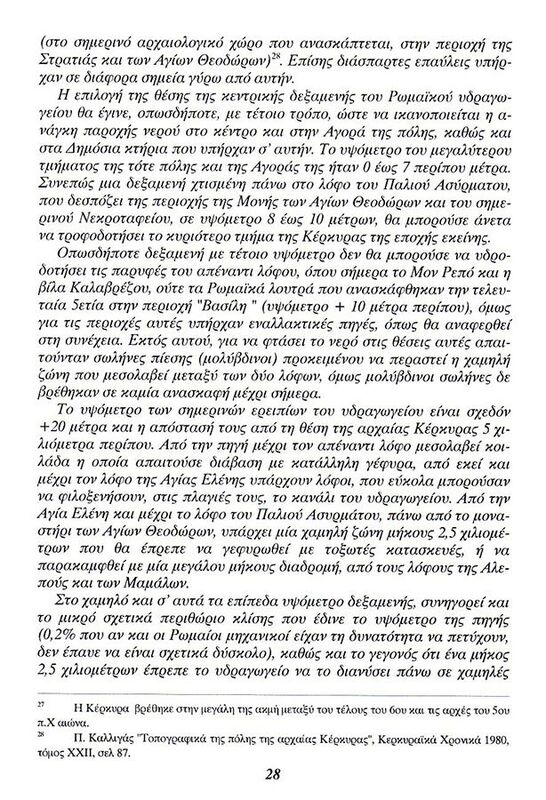 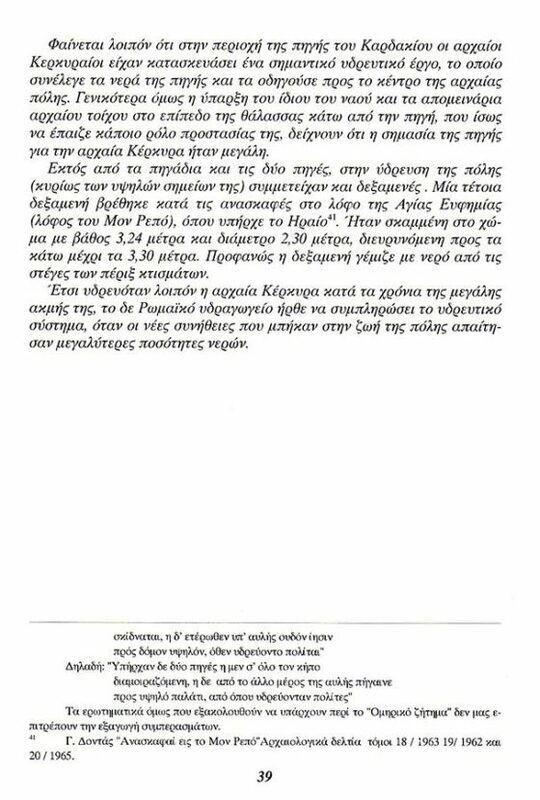 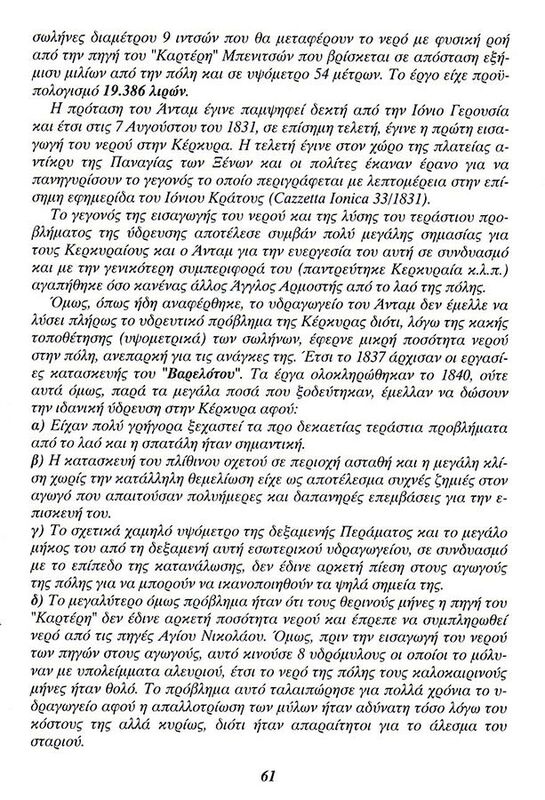 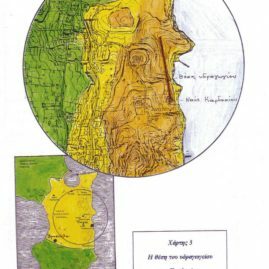 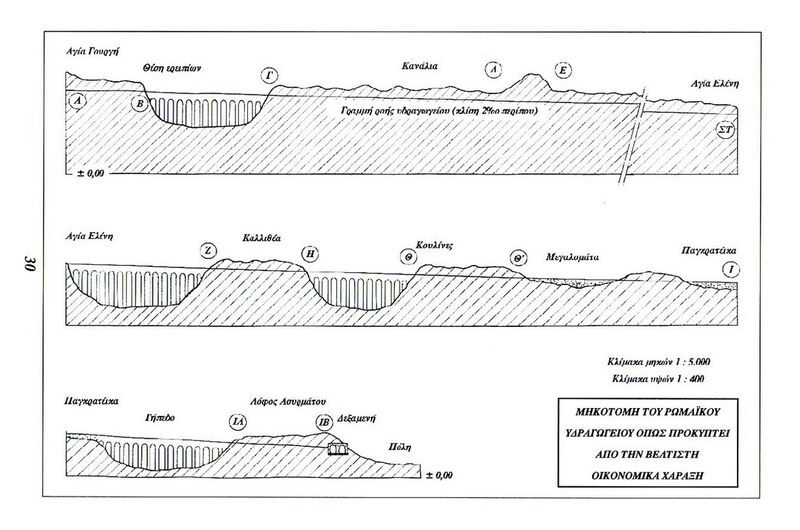 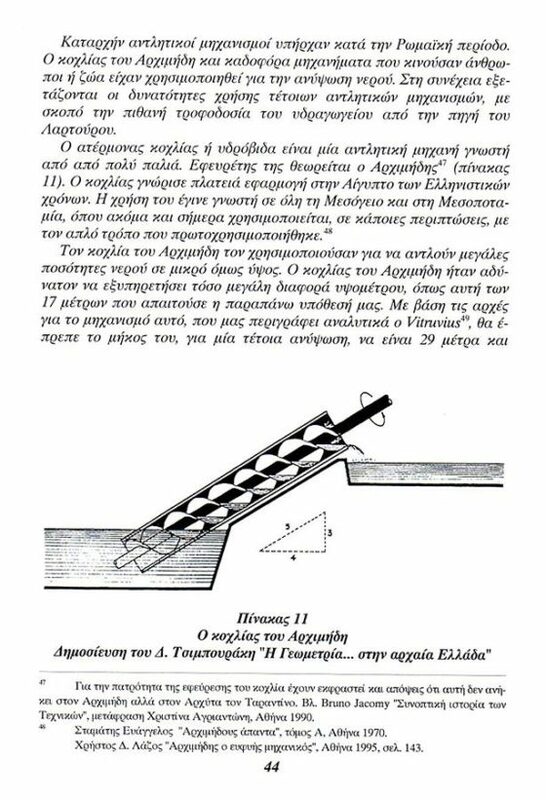 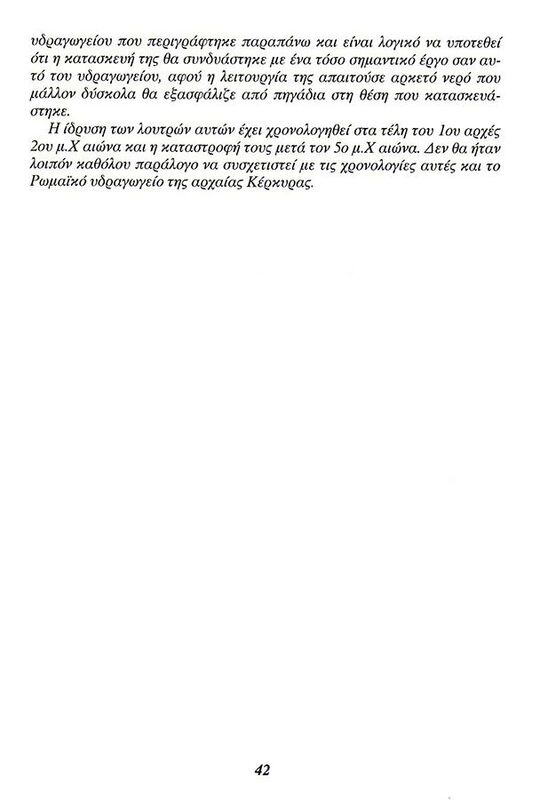 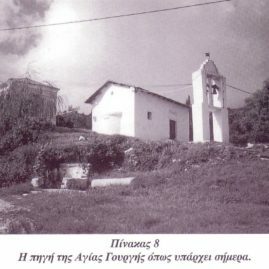 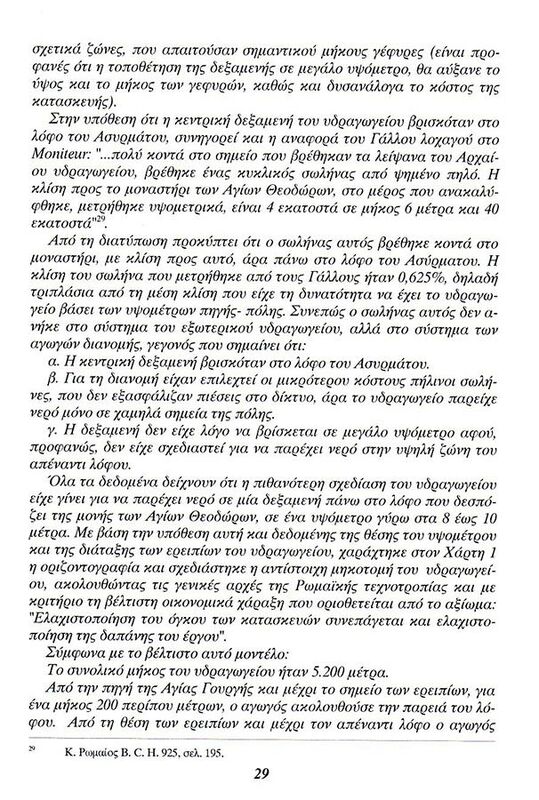 This page is based solely on data and photos from the book of Tassos Katsaros ” THE ANCIENT ROMAN AQUEDUCT OF CORFU ” , the book basically refers to the ancient Roman aqueduct and in an extra added Annex deals with all subsequent works that have been done during followed centuries on the complex problem of water supply of the city of Corfu. 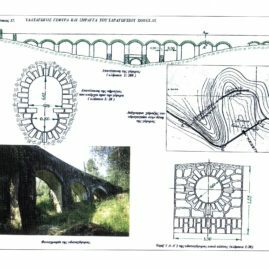 In the above pictures there are pages with the original text of the book where are all the details of the history of the aqueduct . 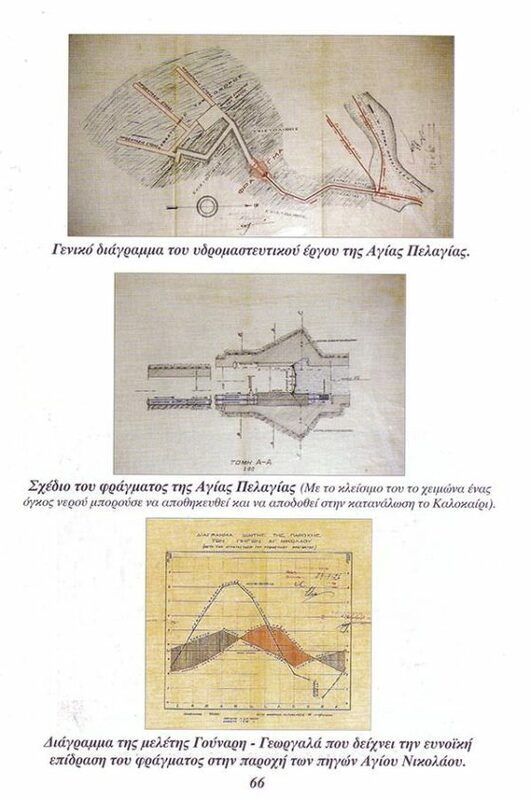 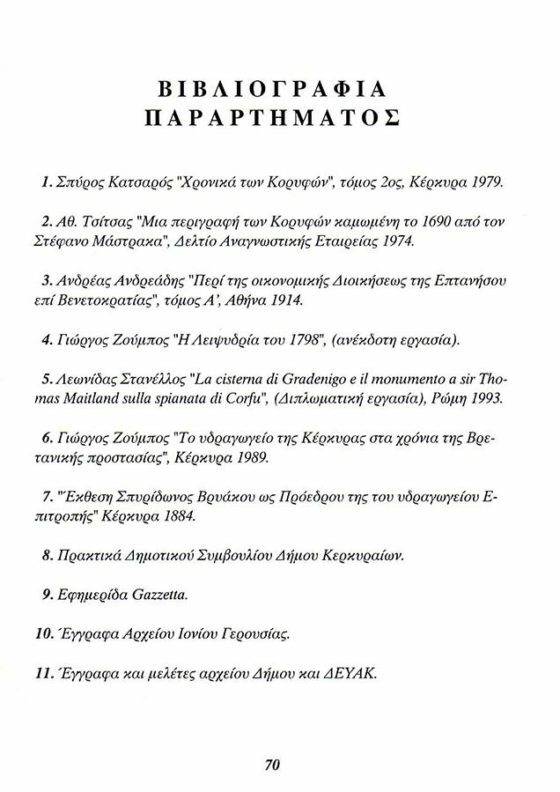 The material came to our hands in the form of digital photos from our friend and fellow citizen Alekos Stratigos whom we thank . 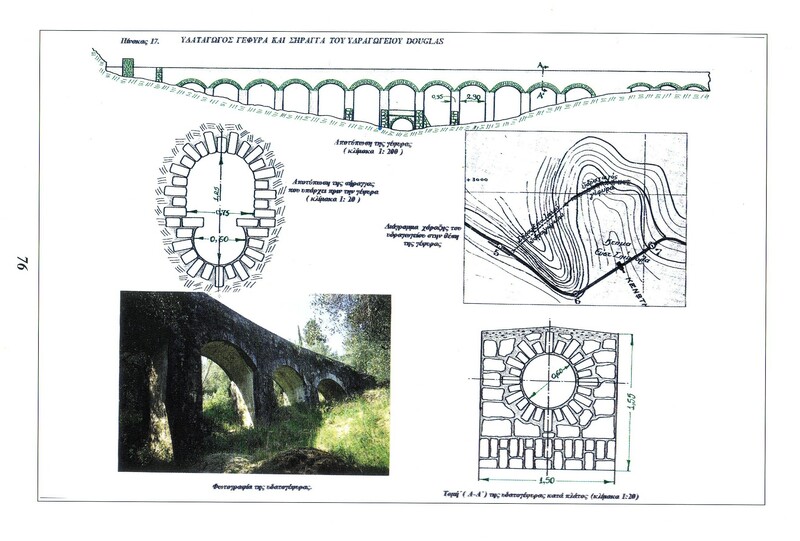 It becomes obvious that the aqueduct in Benitses is a very important piece of history for our village and maybe some younger should start thinking and look for ways to harness this…..